Almost a year ago today, KXNG Crooked released a manifesto in the form of Good Vs Evil. To rewind, Donald Trump had just been elected the 45th President in one of our most controversial presidential elections, divisiveness infiltrated every aspect of the populous, governmental agencies were willingly pumping poison into its communities, protests were raging in the streets, unprovoked police brutality was rampant (with zero accountability) and the societal divide widened with each passing day. With a seemingly basic disregard for human rights, it was understood that we were living in a complicated and dangerous time. 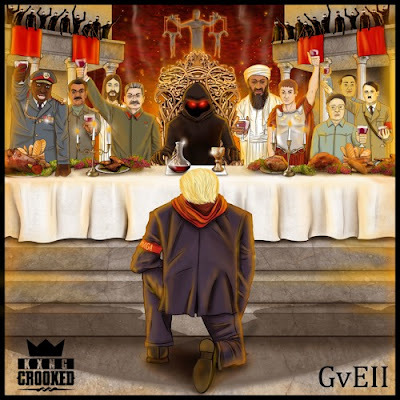 People were in search of answers and a unifying message; KXNG Crooked’s Good Vs Evil could not have appeared at a more needed time as he delivered a project that stared into the face of oppression and struck a nerve. Though it seems counter-intuitive and unimaginative, the year that has passed in-between has led us even further astray. The Donald Trump era has borne witness to fake news, championing racism, bigotry, separatism, sexism and a general contempt for rule of law. Further, he continues his quest to eradicate the health care of millions, advocated a foreign government meddling in an election, diminished our standing in the International community and displayed more concern about the behavior of NFL football players; then he has for the well-being of the citizens he is sworn to uphold. Thankfully, KXNG Crooked’s Good Vs Evil 2: The Red Empire picks up right where its predecessor left off. On the surface, Good Vs Evil 2 is the epitome of woke; a politically and socially conscious decree that demands to be heard and processed. At its core, it’s designed to be the theme music that Colin Kapernick and a generation can proudly knell to. Just like any good leader, Crooked isn’t afraid to rock the boat if a culture change is in order, especially those who have the platform to affect change, but lack the fortitude to do so; and he is more than willing to sacrifice Jason Whitlock for Gregg Popovich. KXNG Crooked Good Vs Evil 2: The Red Empire 12-8-2017!